I always love it when the kids come home from holidays. Eager to hear the stories about their travels and adventures as you sit on their bed watching them unpack their bags. I’m still waiting to hear the stories that accompanied these bags on the bed over the last 6 weeks. Ben arrived home from his holiday last Monday, after visiting Europe, Croatia and Vietnam. I kept in touch with him in the usual ways via the mobile phone, not hearing his voice but by just him posting images of his travels on Instagram. I then knew that he was still ok and having fun like any young adult traveller should. I will be placing a suitcase on my bed just like this photo in a few more weeks to pack as my husband Pete and I explore Canada for 25 days. As you pack the bags for travel you make a list in your mind and recheck it to make sure you have the things you want in there only to realise when you’re on the plane that you’ve forgotten something, you have a mild panic attack and then relax after the thought that wherever you are going would have shops to pick up what it is that you might have forgotten. If that’s the only thing that goes wrong with travel plans you’re lucky. Looking back at photos of our last family holiday as a family of 6 of us I stumble upon a photo of Jacob’s suitcase. 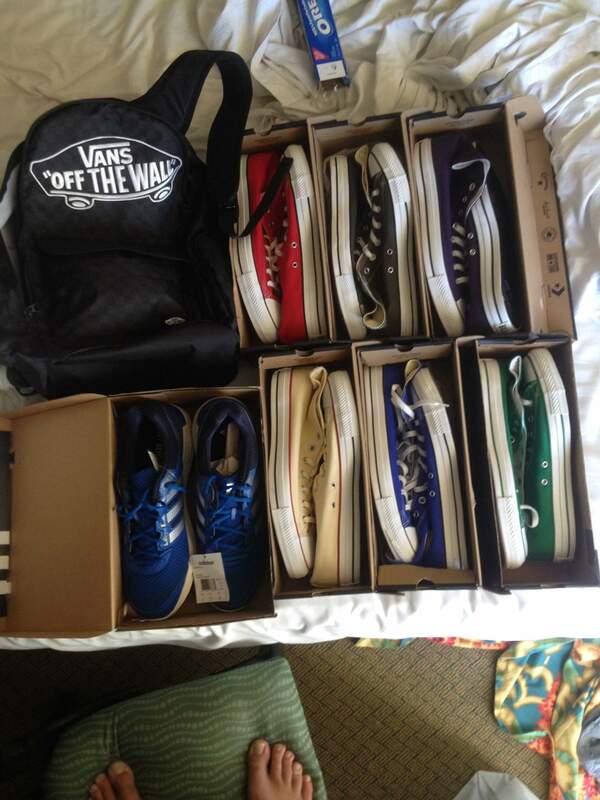 He had taken a photo of the 7 pairs of size 13 Vans shoes from the factory outlet shops in Hawaii as he packed them in his bag on the motel bed. He had bought them in the colours of black, green, blue, red, cream, purple and a dusky grey. I still have a a few colourful pairs of them as my heart won’t let me throw them away. 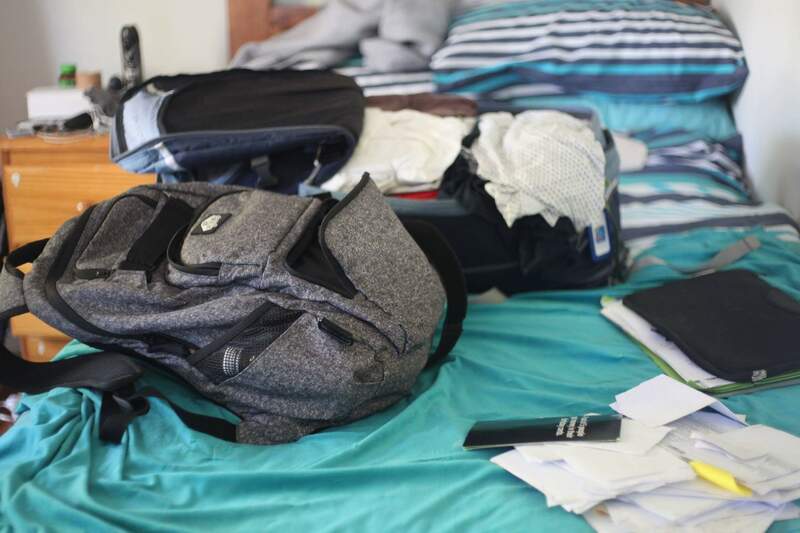 I wish Jacob was just away on holiday and return one day and unpack his travel bag on the bed again like he had many times before. Ben lost this bag on the bed on his travels. He wasn’t at fault. As he arrived in a new country his bags didn’t follow. He began his new expedition without a few essential items but he made do with what he had. I’m sure he borrowed a few supplies from his friend he was travelling with and at the destination the weather dictated that little clothing to be worn as he spent the time in his budgy smugglers. I’m sure he had a pair of shoes too (maybe a pair of Vans like his brothers) and shorts and t-shirt. He finally got his bag back, it had been found at the previous airport. Rachel and Adam will eventually back their own bags when they decide to return home to Australia from the UK and the fun will start again with the unpacking and listening to their stories unfold. Amy is already thinking of packing her bags again as she looks at all her options of where travel will take her as she completes her last year of university for early childhood teaching. I hope we all get plenty more opportunities to pack and unpack for holidays in our own journeys in life and let our memories be our travel bags.